Two new Blu-rays are being released for the TV series, priced at ￥22,500 ($200) + tax each. The first one will cover episodes 13 to 18 and be released on July 21st. The second will do episodes 19 to 24 and will come out on September 21st. But who cares about these, right? The reason I made this thread is to showcase the illustrations Miura drew to go along with them. Neat! Though I would never pay 400$ to get these two! Thanks for posting them, at least I can watch them here. Artwork like that deserves to be attached to a better product. Like another fold-out piece for the manga. IT BELONGS IN A MUSEUM artbook! I'm totally making these my new cellphone wallpapers! Love the party one especially. And I can't wait for a high res of the Volume 39 cover! Beautiful artwork for a terrible series. At least something nice came from it I guess. Can someone explain to me how the "+tax" thing works, as these are mostly factored into what you buy here in Germany. How much more will one realistically pay here. Just curious. I prefer the shot of the armored Guts. That would not be proper. Guts' gear was different during the Black Swordsman arc, this corresponds to the Conviction arc. You're right. Thanks for noticing Guts' outfit discrepancy. 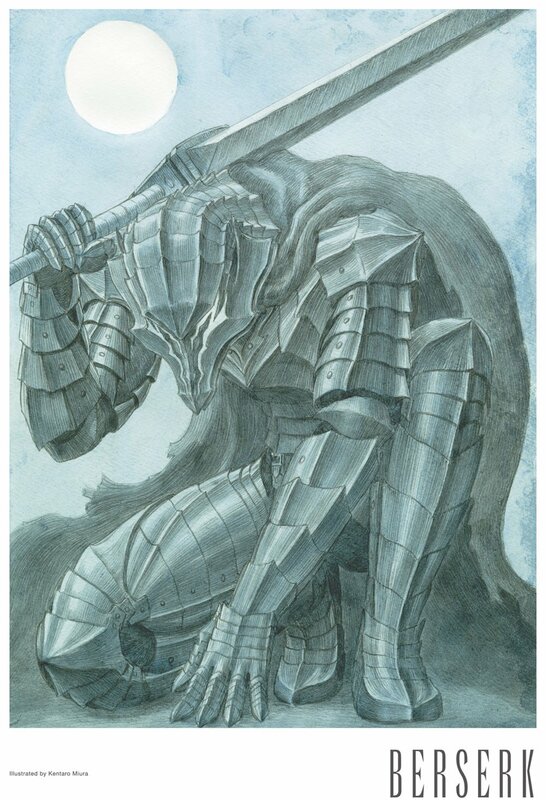 In this case, all that Miura would need to do to that painting is get rid of the additional armor protecting Guts' waist/hips and knees/shins. Plus, change the color of his trousers to black and Guts instantly regains his Black Swordsman-era look. Other than that, the rest of the scene depicted in that painting (i.e rotting skeletons on the ground, evil spirits floating in the air trying to possess Guts' body) would fit the events that take place in the episode 2 of volume 1 quite well. Plus, change the color of his trousers to black and Guts instantly regains his Black Swordsman-era look. The trousers are the same, it's just that leather padding was added to provide better protection. 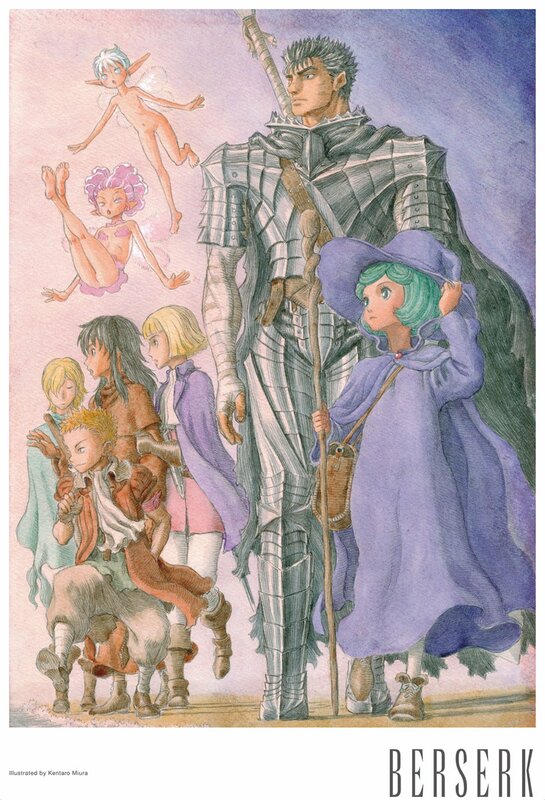 Either way, with just some slight changes to Guts' armor, that painting in question could have been put to far better use as an alternative new cover art for volume 1 as an incentive to get the long-time fans to upgrade from their old Jets Comics copies to the new Young Animal Comics version. Don't you agree? Well they already changed the cover of volume 1 last year, so they weren't going to do it again. That aside, the "slight changes" you're talking about are actually substantial enough that Miura would most certainly rather paint a new illustration. But yeah, it's a cool picture nevertheless.